WHY USE XAMARIN FOR CROSS-PLATFORM MOBILE APP DEVELOPMENT? With global market share of mobile platforms changing at frequent intervals, cross-platform mobile development has become essential for modern businesses. In comparison to native mobile apps, cross-platform mobile application can be developed in a faster and more cost-efficient way. Xamarin Platform makes it easier for developers to rapidly make the same mobile app functional across multiple platforms using a single programming language, i.e., C#. It enables developers to write the app in C#, and share the same code across multiple mobile platforms including Android, iOS and Windows. Xamarin has further integrated the tool with Microsoft’s Visual Studio. So the developers now have option to build mobile apps using the popular and widely used development environment. There are also a number of reasons why Xamarin is used by companies across the world for cross-platform mobile application development. 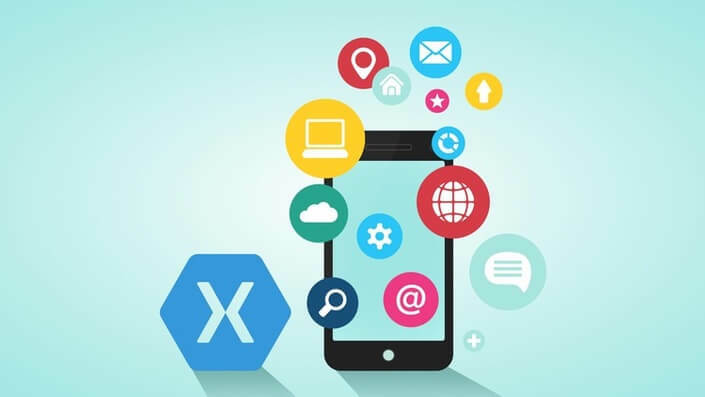 Xamarin Platform is one of the most powerful and comprehensive development environments for cross-platform mobile app development. The users can further integrate it with modern integrated development environments (IDEs) like Xamarin Studio and Microsoft Visual Studio. So the developers can speedup and simplify the mobile app development process by availing the features of multiple IDEs at a time. The compiled code delivered by Xamarin is both dynamic and high-performing. At the same time, the compiled code accesses all native APIs fully. So it becomes easier for programmers to create apps that deliver device-specific experiences across different mobile platforms. The single code base further makes it easier for the business to reduce of supporting and updating the mobile app. While using Xamarin, developers have option to keep the native UIs across iOS, Android and Windows. So they can share the code base and application logic, and extend the API coverage, while preserving the application’s native performance. The platform further helps businesses in reducing development time drastically by reusing the code, tools, and developers’ skills. Xamarin can be integrated seamlessly with the Software Development Kit (SDK) of individual mobile operating systems. Therefore, the developers can use the same code again and again, but avail the native controls of different mobile devices. The programmers can effectuate code sharing by availing portable class libraries, conditional compilation, and file sharing. The sharing and reuse of the single code also significantly reduce the time required for creating modern mobile apps. Along with major mobile platforms, Xamarin also supports smartphones, tablets and wearable devices. As the platform supports the latest mobile devices, it becomes easier for programmers to create innovative mobile apps. For instance, as Xamarin supports Google Glass devices; the developers can create awesome apps for the devices by combining Xamarin Studio, and Android SDK and GDK. The developers have to invest a lot of time and effort to assess the mobile app’s look, feel and performance across multiple devices. They can use Xamarin Test Suite to automatically test the mobile app on 1,000 real devices in the cloud. Also, they have option to write custom test suites, upload them, and run the test cases on a variety of real mobile devices on cloud. The developers can further use Xamarin Insight to monitor and improve the application’s performance. Along with tracking exceptions and crashes, the tool can also be used to rank the issues based on user impact and reach. So they can handle the issues according to their priority without interpreting a huge amount of data. The programmers can use C# with Xamarin to accomplish all tasks that can be performed using Java and Objective-C. As a modern, object-oriented, and general-purpose programming language, C# provides several features to effectuate mobile app development. For instance, C# programmers can use Language integrated queries (LINQ) to support a variety of data store including SQL Server databases and XML documents. Likewise, C# is considered to be the best programming language to write async code in a simple and clean way. On the whole, Xamarin helps enterprises to reduce cross-platform mobile app development time and cost. The platform’s growing popularity has encouraged many mobile development and outsourcing organizations to adopt Xamarin. So the enterprises can easily outsource the cross-platform mobile app development project to a reliable mobile app development company, and curtail both development time and cost.